Hardcover, 11.75 x 9 in. / 120 pgs / 94 images. Klaus Merkel has been photographing stones, rocky landscapes and trees for over thirty years, which he pairs up in double pictures. He portrays the astounding harmony between the animate and the inanimate, between natural and designed manifestations. Fascinating affinities become visible when he shows the limestone blocks of the Great Pyramid of Giza alongside basalt cliffs in Northern Ireland, and the cultivated lime-tree walkway of a castle grounds next to the nave of a cathedral. As the forest of figures and pinnacles of Milan Cathedral is placed next to the sandstone columns of Bryce Canyon, fascinating connections between natural form and art emerge. 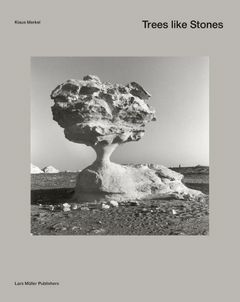 The book thus invites the reader to examine and compare the multiple similarities of the surfaces’ structures of natural as well as artificial objects. FORMAT: Hbk, 11.75 x 9 in. / 120 pgs / 94 images.